I know it doesn’t seem like it, but Halloween is really just around the corner. And while I’m not really into all that Halloween is about, I love the dressing up part. And so naturally, I’m forcing my child to be into it, too. So this week and next week, I’m going to be sharing my homemade costumes that I’ve made for my little guy. The first is his from last year. He was a robot. Now I know that the traditional diy robot costume is one involving cardboard boxes and dryer duct work, but I didn’t think that would go too well with my barely walking 1 year old. And so I devised a different plan. Now before I begin showing you how I put this together, I’ve got to let you know that I am not a master seamstress or even an amateur seamstress. I’m just a mom who thinks she can do these things and then often finds out that she really can’t. So, all that to say, this is not a well constructed costume. But it worked. He wore it to two Halloween parties and even won best kid’s costume at one of them. I was proud… of myself him myself both of us. Also, this was my first time working with a knit fabric. I honestly didn’t even think about the fact that I was working with a knit and therefore would have to employ different techniques. So I had a lot of trial and error. So let me share what I’ve learned about working with a knit. Knit stretches, which is good, but pay attention to which direction it stretches. You want the stretch to go side to side, not up and down. Also, knit doesn’t fray, so you don’t really have to hem, but it doesn’t hurt. And I should add, I made this last year, so I don’t really have the process pictures. But I’ll try to explain what I did. Next week, you’ll get a much better tutorial, I promise! So, I started by first using a pair of my son’s pajamas as a guide. I wanted to make a shiny undersuit that fit him snugly, like his pajamas do. So I turned them inside out and traced them onto my fabric with about a 1/2 inch seam allowance. For the pants, I simply made a front and back of the pants, totally ignoring the middle seam. This worked out all right, but after two nights of crawling around, I did have some pulling at the crotch. 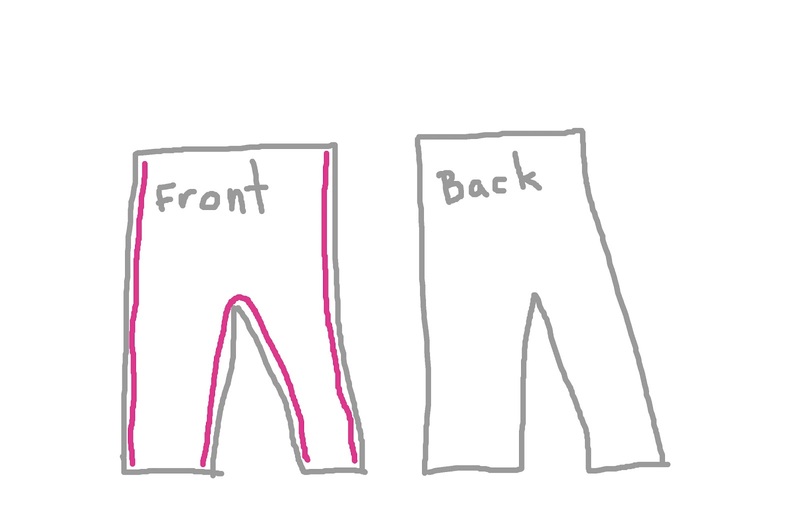 So if you want a better constructed pant, I would make it into four pieces: left front, left back, right front, right back (all with a 1/2 seam allowance). After sewing together, I added some elastic at the top, but just making a hem and sticking the elastic in before sewing shut. 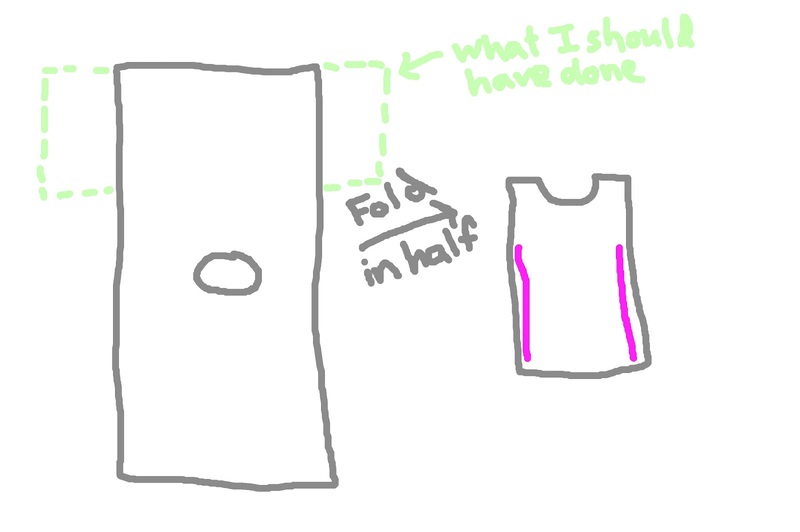 For the shirt, the pajamas I selected were in the baseball t-shirt style for the top, so I mimicked the shape of the pajamas and cut out a front and back house shape, and then made two tubes with a slanted edge for the arms. Then I sewed them all together and hemmed the edges (which wasn’t really necessary). I found that some of my hemming, particularly the neck was way wrong because my sewing prevented the neck hole from being able to stretch to allow Sebastian’s head in. So, I ended up only hemming part of the neck to allow for the knit to stretch. For the body of the robot, the part that makes him look like a robot and not a rockstar, I used some vinyl I found in the clearance aisle of my fabric store. I’ve never worked with vinyl either, so this was some trial and error. I started by making essentially a rectangle with a hole cut out for his head. Then I mistakenly thought that my son was a flat child and cut and sewed the rectangle too small. So I had to cut the back in half and add an extra panel of vinyl. I should have cut a t-shaped piece to allow for the width of my child. I know he’s skinny, but come on, momma…think! For decoration, I made a box shape out of bias tape and filled it in with buttons in the shape of what I imagined a robot control panel to look like. And that’s basically it. 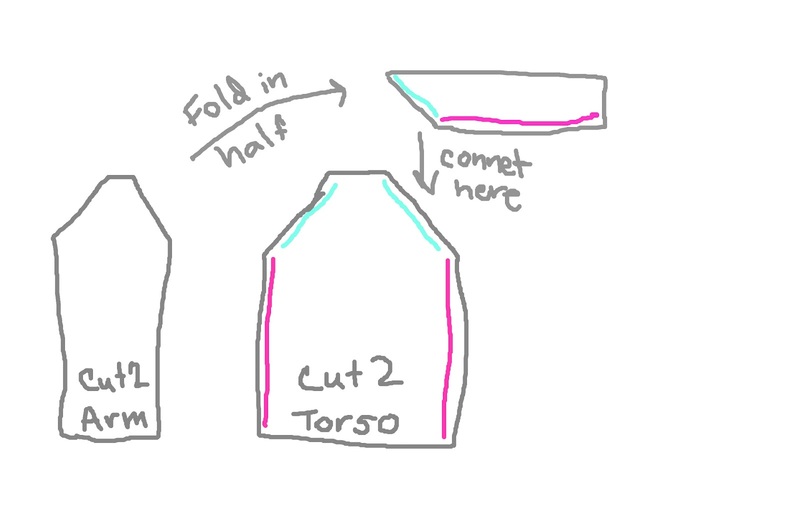 I know it’s not the best tutorial, and you’ll have to excuse my terrible drawings, but I’d be happy to answer any questions if you have any. Thanks for this idea! I'm going to use this idea for my almost 3 year old's robot costume. I do not yet think that she is tolerant enough for a box, but she has fallen in love with Elmo's Memory Bot and wants to be just like him for Halloween! Thanks for sharing this adorable robot costume and tutorial! It's a good alternative for youngsters who might not want to be confined in the more traditional boxy robot costume. In case you (and your readers) are interested, there is a creative costume contest happening at http://www.halloweenhero.com/costume-contest-2013.html and there is a $250 grand prize. Thank you again for your creative tutorial – it's very helpful! A Costume Contest? How fun! I'll definitely be checking your site out! So cute! About how much fabric did you purchase for the body? Thanks!